Wondering how a Gap Year or overseas travel experience can benefit? Maybe it’s better explained by a young person who has done it, like Patrick Stobie, who wrote the following article for the United Nations and found himself lecturing with representatives from the UN after joining us in Samoa earlier this year. We’re sure you’ll agree that it’s very impressive. A sentiment made by Nelson Mandela during his incarceration was quoted by wildlife activist Boyd Varty during a TED Conference in Johannesburg, early June 2013. While such a quote may resonate an impressionistic cliché, through the course of the year I could not help but dwell on its philosophical depth. Nelson Mandela’s response sparked a year of grand introspection and praxis which inevitably led to my decision to travel to Samoa: my life changing experience. My privileged upbringing granted me countless opportunities to immerse myself in humanitarian work. Be it volunteering in local schools or travelling interstate to build communities, the commonality of all my experiences have shown me that in the process of working for social equality and justice outwardly, it is also important for one to continue to critically examine themselves; shedding attitudes and behaviours that are oppressive, to make room for those that are more inclusive and humanitarian. It was in Samoa that I realised this most. Coming from the fast-paced world of working in a public hospital where ‘patient care’ is ingrained into all employees, the process becomes so hardened its rigidity restricts the development of philanthropic thinking and pace barely allows one time to pause and reflect on that. Stepping into the relaxed, altruistic culture of Samoa, whilst the change was a little difficult to adjust to, it was soon brought to my attention that if we do not pause and simply capture what we are doing, it becomes too easy for one to lose their motive. It was this notion that drove my humanitarian work overseas. I started out teaching in a small private school, Aoga Fiamalamalama, built to cater and support the needs of intellectually and physically disabled students and their families. Having volunteered in special education units around Australia I thought I’d be somewhat prepared for what was in store; how wrong I was. The students, while speaking little English, harboured stories filled with so much sadness, terror and dread it felt I had been thrown into a George Romero or David Lynch film. With regular attendance from thirty students and five staff members, disabilities ranged from slow learning and autism to cerebral palsy, down syndrome and epilepsy (a combination of at least four in some cases) it soon became apparent that Aoga Fiamalamalama was more a family before anything else; they all believe that we are the same in this notion: that the potential for greatness lives within each of us. It was this motif that truly opened my eyes to the beautiful nature of the Samoan people. Having organised my work it was obvious Aoga Fiamalamalama had a high number of volunteers rotating through, all driven to make a difference. It was simply breathtaking to observe some of the work previous volunteers had undertaken, each leaving a distinguishable mark on the school’s community. One of my first challenges quickly became deciding what and how I was going to leave my own mark. I couldn’t simply just teach and be a passive volunteer if I was to stay true to the process of introspection, I had to get involved on a more intimate and intellectual level. As it were, on my third day of placement, I recall sitting in on one of the “slow-learner’s class’” thinking of ways I could possibly impact these children’s lives for the better, in ways they have not seen before. Meanwhile the teacher (who also happened to be the principle) continued teaching the class basic life skills in hope to send one or two boys back into the mainstream education system. There was countless repetition of simple concepts such as counting to 10, and telling time – the real necessities to get by regular day-to-day life in Samoa. It then struck me that perhaps that is where I could leave my mark; not in the classroom but behind the scenes in terms of seeing the children succeed outside of the school’s fences. I began thinking with gross ambition, speculating the possibility of establishing support bases for the families of the students – providing them with simple access to care, support and understanding of their child’s disabilities. Unfortunately I dismissed this rather quickly upon realising the very limited resources and skeleton funding Aoga Fiamalamalama received. An idea then presented itself in the form of the principle admitting to not having a curriculum to teach. 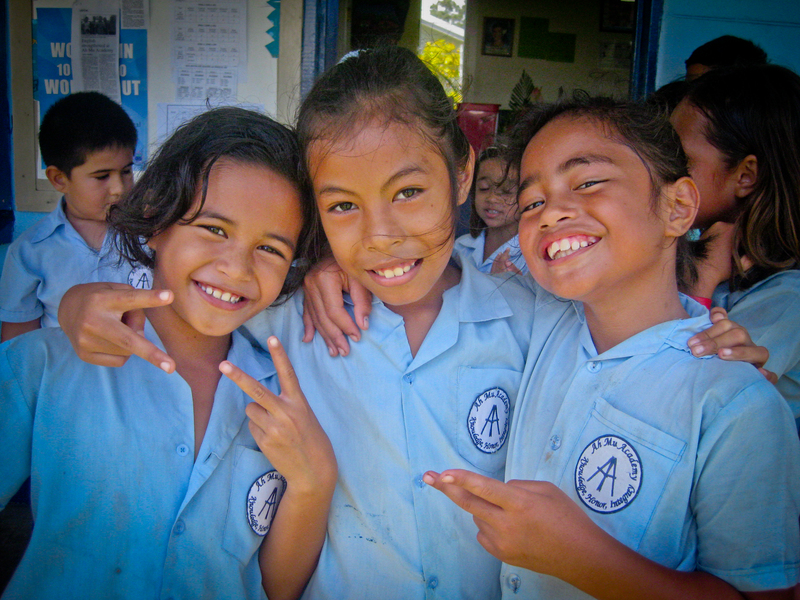 In Samoa, schools were so under resourced (and severely under-funded) that they cannot develop the capability to adapt mainstream education to suit the needs of disabled students; something which appears to be common practice amongst first world countries. After some thought on how developing a special-needs-curriculum could be achieved, I approached the principle to gather her support. Needless to say she was on board. I placed a few calls to a friend of mine in Australia’s Department of Education and proceeded to work with him closely in the rapid re-branding, tweaking and re-production of The Australian Curriculum as The Samoan Curriculum for Disabled Education. It entailed a Samoan-specific spin on the Australian curriculum from Years 1 through 4. The ultimate goal was to produce intellectually and emotionally competent graduates who possess the basic literacy, numeracy and communicative skills necessary for employment (this was in hope to help provide their own families who have, majoratively, struggled financially for some length of time). It was a long and enduring process; constant printing, reviewing, editing and re-printing, but After 3 long weeks the final draft had been prepared. The only roadblock that remained was to confirm the attainment of permissions from the Australian High Commissioner to re-brand The Australian Curriculum in such a way (which was approved). The rapid movement of progression of this project had gained such momentum that everything seemed to fall in place rather quickly before it. The Samoan Ministry of Education had assembled a board of executives to review the final draft and discuss its dissemination and integration into their education system. Meetings were held; hands were shaken and presentations were given. The idea produce The Samoan Curriculum for Disabled Education was highly praised and very well received. To reflect upon the obvious, we all sought to live a life that is fruitful in working towards the improvement of the human condition; to intentionally live in a manner that shows respect for all by fostering caring and mutually respectful relationships. It became apparent that this can be achieved by having a commitment to continuous learning. As such, the executives made a number of final adjustments to ensure their outcomes were perceived with great gusto and enthusiasm. We had achieved success in capturing the heart of the Samoan People and incorporating it into an invaluable resource that (hopefully) will enhance special needs students experience of life and sub-sequentially improve their standard of living emotionally, intellectually and physically. It is amazing how opportunities can present themselves. This one simply started with an introduction. During my time with the Samoan Ministry of Education I ended up meeting a Frenchman by the name of Alexander Despeyroux who was a Human Rights Specialist for the United Nations, in town for a 3-day conference on the Convention of Human Rights for People with Disabilities. Nearing the end of my fourth week, I was talking to a secretary in the Ministry of Health about my work experience with facilitating special needs units around Australia, the level of health care and my own interests in health economics (She had been on the board of executives that received the drafted curriculum). It was simply a matter of being in the right place at the right time; we began discussing the curriculum on a more colloquial level when Mr. Despeyroux passed through. After a brief but thorough introduction, Alex chimed in and insisted we show him the final document. He was suitably impressed and endorsed the rationale behind it, inviting me to attend and offer my piece at the Conference over the next few days. disabilities: particular emphasis on their human rights. Following the conference’s warm reception of the curriculum and sharing of experiences Alex extended an invitation from the United Nations to partake in these presentations. While my role was significantly less compared to Alex’s, it entailed lengthy talks on outcome-benefit analyses of integrated learning for disabled students, and the discussion of needs for supporting sustainable lifestyles for the disabled population in general. We travelled around the islands for two weeks presenting to various government officials, educators, families and students as an extension of the United Nation’s presence in the Pacific Islands. By this point of my journey my eyes had truly been opened not just by the kind, heart-warming nature of the Samoan people, but by their strong sense of belief and support that they place in common goals. They truly believe that we are all teachers and learners. From this, ultimately, the humanitarian expedition became about coalition building between the Samoan people; students, families and the Samoan government. If we can see that we each play a role in how conditions are either improved or perpetuated, the hope is that it will help us to be able to want to work together. In my experiences fear of being wrong; fear of being vulnerable, continues to prove it a formidable barrier to working through conflict in ways that can create meaningful and equitable change. The Samoan people, whilst being a very proud nation, embraced this idea tentatively but used it to their advantage and begun contributing terrifically to the excitement of humanizing change. To quote Nelson Mandela once again, “The brave man, after all, is not he who does not feel afraid but he who conquers that fear”. Nothing, however, is achieved in isolation. If you look long enough, everything is connected to something. Finding those connections is where the work lies, and that work is so expansive that none of us can do it on our own. The students and teachers at Aoga Fiamlamalama, the officials within the Ministry of Education and the people of the villages we visited along the way all played their respective parts and continue to play their respective parts in uplifting their human conditions; taking pride in their nation, as education is slowly becoming the most powerful weapon to exact change upon the world. Collaboratively we had provided the disabled population of Samoa with the tools of change; to change their world and the world of every man, woman and child whose lives they have touched and will touch. The power of improving conditions had been passed onto the special students of Samoan culture. We could not have hoped for a better result; the real reward was to watch these students grow emotionally as well as intellectually, grasping a fuller concept of life and the potential they can achieve. This was beyond reward enough.